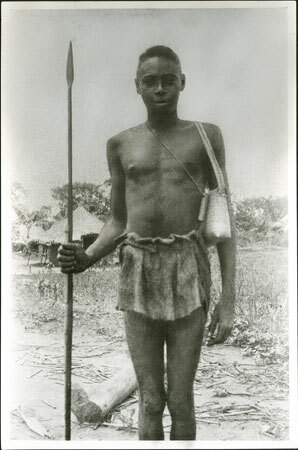 A full length portrait of a man carrying a spear (baso) and a mourner's small grass bag with a shoulder strap (mongu). Also hung around his shoulder is a magic whistle (kura), which is here identified as being used by a mourner as an action against the witchcraft involved in the death of a relative (vengeance-magic). Morton, Chris. "Zande man with spear, bag and whistle" Southern Sudan Project (in development). 03 Jan. 2006. Pitt Rivers Museum. <http://southernsudan.prm.ox.ac.uk/details/2005.111.5/>.